Rosh Hashanah, the one of the important carnivals of Jews, is celebrated with different rituals and sacraments by different communities of Jews. But, the spirit and soul of this picky festival remain almost the same for all. The delightful celebrations of Rosh Hashanah bind the hearts and souls of every jew. Shofar, blown on Rosh Hashanah, is a Ram’s horn which is used like a trumpet. One of the most vital observances of this impressive carnival is listening to the tunes of Shofar in the synagogue. The shofar hits 100 notes every day. 4 different types of notes include tekiah (sustains for 3 seconds), Shevarim (3 one second notes), teruah gedolah (also known as big tekiah) and the last but not the least is a set of tunes which last for approximately 10 seconds. Even though the Bible didn’t mention any specific reason for blowing the Shofar but it is believed that the sound of Shofar is a call to remorse. 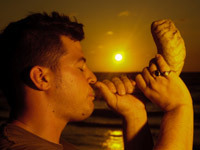 The Shofar is not blown if the holiday falls on Shabbat according to the Jews custom. - "Our Father, Our King"
- It Comprises of 44 admissions of fault and asks the God to forgive every sin. - "On Rosh Hashanah our destiny is written; at the end of Yom Kippur it is sealed. Who shall live and who shall die? Who by fire and who by water?" - This particular prayer accompanies the shofar. - Three blessings: Be familiar with the power of the almighty, recalling Jewish history and connect to the various past and future events of Judaism by the tunes of Shofar. 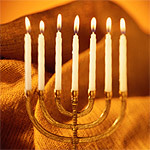 Lighting candles and saying Kiddush, are the righteous practices in Judaism which bring the Sabbath and other sacred days. For Rosh Hashanah, special prayers accompany the process of lighting the candles. The melodious prayer signifies the specialty and uniqueness of the holidays. It is recommended that no one should work on Rosh Hashanah. Most of the times of the day are spent in Syngogue. Daily liturgy is somewhat expanded in synagogue. Machzor, the special prayer book, is followed during Rosh Hashanah due to the extensive liturgical changes for these holidays. Dipping an apple in the honey and eating it during Rosh Hashanah are the other rituals. This symbolizes the wish of a prosperous New Year. The taste of the apple is amazing. Jews also eat bread dipping in the honey as well for the same reason. During Tashlikh, another accepted and admired practice of Rosh Hashanah, jews walk on the water streams of any river on the first day afternoon of Rosh Hashanah and vacant their pockets. It symbolically signifies casting off the committed sins. Small pieces of breads are kept in the pockets for this. Even though the Bible doesn’t say to follow this particular tradition but this custom is followed from many years. If the first day of Rosh Hashanah falls on Shabbat, then many synagogues observe Tashlikh on the afternoon of Sunday. The motive behind this is to avoid carrying bread in the pockets on Shabbat. The fabulous festival ends when everybody greets each other and says “L'shanah tovah” which means “for a good year”. This is a shorter phrase of "L'shanah tovah tikatev v'taihatem". Meaning of this particular line is "May you be inscribed and sealed for a good year."